Born 1947. Studied art under the guidance of honored painter of Russia E.N. Zonina. Graduated Mstera Art School in 1967. Beginning of 80's, he participated at the VDNKh exhibits (VDNKh is a big exhibition complex in north Moscow) where he was honored with two bronze medals. 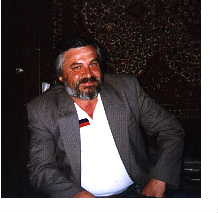 His works are presented in several catalogs published in Russia. 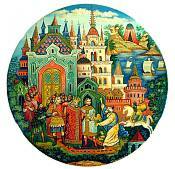 His work "Tale of Tsar Saltan" is presented in the book Russian Lacquered Miniatures (by Vladimir Guliayev, Aurora Art Publishers, Leningrad 1989). Notable lacquer box expert Lucy Maxym has his works in her own collection and his name is mentioned in her book Russian Lacquers, Legends and Fairy Tales" as one of the top artists in Mstera. Tikhomirov received the honor of painting an egg which was presented to the former president of Russia Boris Eltsin from the Vladimir district. The artist is skilled in painting on a wide variety of materials. He showed us a clock that he decorated and painted with absolutely amazing skill. His works can be found in the Museum of History, Museum of Revolution, Museum of Applied Art (Moscow), Russian Museum in St. Petersburg. Tikhomirov's boxes run the gamut from very traditional fairy tale Mstera pieces to spiritual religious works. Tikhomirov likes to paint and do it "with soul" as he says. Tikhomirov showed us several lovely oil paintings, which he does as a hobby. Valentin Tikhomirov is married and has two daughters. 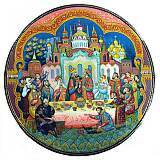 The family lives in Mstera where the talented people keep alive the spirit of old tales and legends of Russia. 6.75" x 5.75" x 1.25"
9.50" x 4.50" x 1.50"
7.00" x 4.88" x 1.63"
6.75" x 5.00" x 2.00"